Taken from approximately the same perspective as John Filo's famous photograph. The Kent State shootings, also known as the May 4 massacre or Kent-State massacre, occurred at Kent State University in the city of Kent, Ohio , and involved the shooting of unarmed college students by members of the Ohio National Guard on Monday, May 4, 1970. The guardsmen fired 67 rounds over a period of 13 seconds, killing four students and wounding nine others, one of whom suffered permanent paralysis. Some of the students who were shot had been protesting against the American invasion of Cambodia, which President Richard Nixon announced in a television address on April 30. However, other students who were shot had merely been walking nearby or observing the protest from a distance. There was a significant national response to the shootings: hundreds of universities, colleges, and high schools closed throughout the United States due to a student strike of four million students, and the event further divided the country, at this already socially contentious time, along political lines. Richard Nixon had been elected President in 1968, promising to end the Vietnam War. In November 1969, the My Lai Massacre was exposed, prompting widespread outrage around the world and leading to increased public opposition to the war. In addition, the following month saw the first draft lottery instituted since World War II. The war had appeared to be winding down throughout 1969, so the new invasion of Cambodia angered those who believed it only exacerbated the conflict. Many young people, including college students and teachers, were concerned about being drafted to fight in a war that they strongly opposed. The expansion of that war into another country appeared to them to have increased that risk, though the number of troops serving in Vietnam peaked in 1967, well before that time. Across the country, campuses erupted in protests in what Time called "a nation-wide student strike", setting the stage for the events of early May 1970. President Richard Nixon announced to the nation that an incursion into Cambodia had been launched by United States combat forces. At Kent State University, a demonstration with about 500 students was held on May 1 on the Commons (a grassy knoll in the center of campus traditionally used as a gathering place for rallies or protests). As the crowd dispersed to attend classes by 1 p.m. another rally was planned for May 4 to continue the protest of Nixon's expansion of the Vietnam war into Cambodia . There was widespread anger, and many protesters issued a call to "bring the war home." As a symbolic protest to Nixon's decision to send troops, a group of students watched a graduate student burying a copy of the U.S. Constitution while another student burned his draft card. Trouble exploded in town around midnight when people left a bar and began throwing beer bottles at cars and breaking downtown store fronts. In the process they broke a bank window which set off an alarm. The news spread quickly and it resulted in several bars closing early to avoid trouble. Before long more people had joined the vandalism and looting. By the time police arrived, a crowd of about 100 had already gathered. Some people from the crowd had already lit a small bonfire in the street. The crowd appeared to be a mix of bikers, students, and out-of town youths who regularly came to Kent's bars. A few members of the crowd began to throw beer bottles at the police, and then started yelling obscenities at them. The disturbance lasted for about an hour before the police restored order. By that time most of the bars were closed in the downtown area of Kent. Kent's Mayor Leroy Satrom declared a state of emergency on May 2 and, later that afternoon, asked Ohio Governor James A. Rhodes to send the National Guard to Kent to help maintain order. When the National Guard arrived in town that evening (at around 10 P.M.), a large demonstration was already under way on the campus, and the campus Reserve Officer Training Corps (ROTC) building (which had been scheduled for demolition) was burning. The arsonists were never apprehended and no one was injured in the fire. More than a thousand protesters surrounded the building and cheered the building's burning. While attempting to extinguish the fire, several Kent firemen and police officers were hit with rocks and other objects by those standing near the fire. More than one fire engine company had to be called in because protesters carried the fire hose into the Commons and slashed it. The National Guard made many arrests, tear gas was used, and at least one student was wounded with a bayonet. During a press conference, Governor Rhodes called the protesters un-American and referred to the protesters as revolutionaries set on destroying higher education in Ohio. "They're worse than the brown shirts and the communist element and also the night riders and the vigilantes," Rhodes said. "They're the worst type of people that we harbor in America. I think that we're up against the strongest, well-trained, militant, revolutionary group that has ever assembled in America." Rhodes also claimed he would obtain a court order declaring a state of emergency, banning further demonstrations, and gave the impression that a situation akin to martial law had been declared; however he never attempted to obtain such an order. During the day some students came into downtown Kent to help with cleanup efforts after the rioting, which met with mixed reactions from local businessmen. Mayor Satrom, under pressure from frightened citizens, ordered a curfew until further notice. Around 8:00 p.m., another rally was held on the campus Commons. By 8:45 p.m. the Guardsmen used tear gas to disperse the crowd, and the students reassembled at the intersection of Lincoln and Main Streets, holding a sit-in in the hopes of gaining a meeting with Mayor Satrom and President White. At 11:00 p.m., the Guard announced that a curfew had gone into effect and began forcing the students back to their dorms. Ten Guardsmen were injured and a few students were bayoneted by Guardsmen. On Monday, May 4, a protest was scheduled to be held at noon, as had been planned three days earlier. University officials attempted to ban the gathering, handing out 12,000 leaflets stating that the event was canceled. Despite this, an estimated 2,000 people gathered on the university's Commons, near Taylor Hall. The protest began with the ringing of the campus's iron Victory Bell (which had historically been used to signal victories in football games) to mark the beginning of the rally, and the first protester began to speak. Fearing that the situation might escalate into another violent protest, Companies A and C, 1/145th Infantry and Troop G of the 2/107th Armored Cavalry, Ohio Army National Guard (ARNG), the units on the campus grounds, attempted to disperse the students. The legality of the dispersal was later debated at a subsequent wrongful death and injury trial. On appeal, the United States Court of Appeals for the Sixth Circuit ruled that authorities did indeed have the right to disperse the crowd. The dispersal process began late in the morning with campus patrolman Harold Rice, riding in a National Guard Jeep, approaching the students to read them an order to disperse or face arrest. The protesters responded by throwing rocks, forcing the Jeep to retreat. Just before noon, the Guard returned and again ordered the crowd to disperse. When most of the crowd refused, the Guard used tear gas. Because of wind, the tear gas had little effect in dispersing the crowd, and some began a second rock attack with chants of "Pigs off campus!" The students lobbed the tear gas canisters back at the National Guardsmen, who wore gas masks. When it was obvious the crowd was not going to disperse, a group of 77 National Guard troops from A Company and Troop G, with bayonets fixed on their weapons, began to advance upon the hundreds of protesters. As the guardsmen advanced, the protesters retreated up and over Blanket Hill, heading out of The Commons area. Once over the hill, the students, in a loose group, moved northeast along the front of Taylor Hall, with some continuing toward a parking lot in front of Prentice Hall (slightly northeast of and perpendicular to Taylor Hall). The guardsmen pursued the protesters over the hill, but rather than veering left as the protesters had, they continued straight, heading down toward an athletic practice field enclosed by a chain link fence. Here they remained for about ten minutes, unsure of how to get out of the area short of retracing their entrance path (an action some guardsmen considered might be viewed as a retreat). During this time, the bulk of the students congregated off to the left and front of the guardsmen, approximately 150 ft,(50m) to 225 ft,(75m) away, on the veranda of Taylor Hall. Others were scattered between Taylor Hall and the Prentice Hall parking lot, while still others, perhaps 35 or 40, were standing in the parking lot, or dispersing through the lot as they had been previously ordered. While on the practice field, the guardsmen generally faced the parking lot which was about 100 yards away. At one point, some of the guardsmen knelt and aimed their weapons toward the parking lot, then stood up again. For a few moments, several guardsmen formed a loose huddle and appeared to be talking to one another. The guardsmen appeared to be unclear as to what to do next. They had cleared the protesters from the Commons area, and many students had left, but many stayed and were still angrily confronting the soldiers, some throwing rocks and tear gas canisters. At the end of about ten minutes, the guardsmen began to retrace their steps back up the hill toward the Commons area. Some of the students on the Taylor Hall veranda began to move slowly toward the soldiers as the latter passed over the top of the hill and headed back down into the Commons. At this point, at 12:22 PM, a number of guardsmen at the top of the hill abruptly turned and fired their M1 Garand rifles at the students. The guardsmen directed their fire not at the closest students, who were on the Taylor Hall veranda, but at those on the grass area and concrete walkway below the veranda, at those on the service road between the veranda and the parking lot, and at those in the parking lot. Bullets were not sprayed in all directions; instead, they were confined to a fairly limited line of fire leading from the top of the hill to the parking lot. Not all the soldiers who fired their weapons directed their fire into the students. Some soldiers fired into the ground, while a few fired into the air. In all, 29 of the 77 guardsmen claimed to have fired their weapons, using a final total of 67 bullets. The shooting was determined to have lasted only 13 seconds, although a New York Times reporter stated that "it appeared to go on, as a solid volley, for perhaps a full minute or a little longer." The question of why the shots were fired remains widely debated. Photo taken from the perspective of where the Ohio National Guard soldiers stood when they opened fire on the students. The Adjutant General of the Ohio National Guard told reporters that a sniper had fired on the guardsmen, which itself remains a debated allegation. Many guardsmen later testified that they were in fear for their lives, which was questioned partly because of the distance of the wounded students. Time magazine later concluded that "triggers were not pulled accidentally at Kent State". The President's Commission on Campus Unrest avoided probing the question regarding why the shootings happened. Instead, it harshly criticized both the protesters and the Guardsmen, but it concluded that "the indiscriminate firing of rifles into a crowd of students and the deaths that followed were unnecessary, unwarranted, and inexcusable." The shootings killed four students and wounded nine. Two of the four students killed, Allison Krause and Jeffrey Miller, had participated in the protest, and the other two, Sandra Scheuer and William Knox Schroeder, had been walking from one class to the next at the time of their deaths. Schroeder was also a member of the campus ROTC chapter. Of those wounded, none was closer than 71 feet to the guardsmen. Of those killed, the nearest (Miller) was 265 feet away, and their average distance from the guardsmen was 345 feet. Two men that were on the campus recounted what they saw. Unknown speaker 1: "Suddenly, they turned around, got underneath, as if they were ordered to, they did it all together, aimed. And personally, I was standing there saying, they're not going to shoot, they can't do that. If they are going to shoot, it's going to be blank." Unknown speaker 2: "The shots were definitely coming my way, because when a bullet passes your head, it makes a crack. I hit the ground behind the curve, looking over. I saw a student hit, he stumbled and failed, to where he was running towards the car. Another student tried to pull him behind the car, bullets were coming through the windows of the car. "As this student fell behind the car, I saw another student go down, next to the curb, on the far side of the automobile, maybe 25 or 30 yards from where I was lying. It was maybe 25, 30, 35 seconds of sporadic firing. "The firing stopped. I lay there maybe 10 or 15 seconds. I got up, I saw four or five students lying around the lot. By this time, it was like mass hysteria. Students were crying, they were screaming for ambulances. I heard some girl screaming, 'They didn't have blank, they didn't have blank,' no, they didn't." In the "Presidents Commission on Campus Unrest" they mistakenly list Thomas V. Grace, who is Thomas Mark Grace's father, as the Thomas Grace injured. "I don't care whether you've never listened to anyone before in your lives. I am begging you right now. If you don't disperse right now, they're going to move in, and it can only be a slaughter. Would you please listen to me? Jesus Christ, I don't want to be a part of this...!" After 20 minutes of speaking, the students left the Commons, as ambulance personnel tended to the wounded, and the Guard left the area. Upon contacting appropriate officers of the Ohio National Guard at Ravenna and Akron, Ohio, regarding ONG radio logs and the availability of service record books, the respective ONG officer advised that any inquiries concerning the Kent State University incident should be direct to the Adjutant General, ONG, Columbus, Ohio. Three persons interviewed regarding reported conversation by Sgt Lawrence Shafer, ONG, that Shafer had bragged about "taking a bead" on Jeffrey Miller at the time of the ONG shooting and each interviewee unable to substantiate such a conversation. In an interview broadcast in 1986 on the ABC News documentary series Our World, Shafer identified the person that he fired at as Joseph Lewis. Photographs of the dead and wounded at Kent State that were distributed in newspapers and periodicals worldwide amplified sentiment against the United States' invasion of Cambodia and the Vietnam War in general. In particular, the camera of Kent State photojournalism student John Filo captured a fourteen-year old runaway, Mary Ann Vecchio, screaming over the body of the dead student, Jeffrey Miller, who had been shot in the mouth. The photograph, which won a Pulitzer Prize, became the most enduring image of the events, and one of the most enduring images of the anti-Vietnam War movement. The shootings led to protests on college campuses throughout the United States , and a student strike—causing more than 450 campuses across the country to close with both violent and non-violent demonstrations. A common sentiment was expressed by students at New York University with a banner hung out of a window which read "They Can't Kill Us All." On May 8, an antiwar protest at New York's Federal Hall held at least partly in reaction to the Kent State killings was met with a counter-rally of pro-Nixon construction workers organized by Peter J. Brennan, later appointed U.S. Labor Secretary by President Nixon, resulting in the "Hard Hat Riot". Just five days after the shootings, 100,000 people demonstrated in Washington, D.C. against the war and the killing of unarmed student protesters. Ray Price, Nixon's chief speechwriter from 1969-74 recalled the Washington demonstrations saying, "The city was an armed camp. The mobs were smashing windows, slashing tires, dragging parked cars into intersections, even throwing bedsprings off overpasses into the traffic down below. This was the quote, student protest. That's not student protest, that’s civil war." Not only was Nixon taken to Camp David for two days for his own protection, but Charles Colson (Counsel to President Nixon from 1969 to 1973) stated that the military was called up to protect the administration from the angry students, he recalled that "The 82nd Airborne was in the basement of the executive office building, so I went down just to talk to some of the guys and walk among them, and they're lying on the floor leaning on their packs and their helmets and their cartridge belts and their rifles cocked and you’re thinking, 'This can't be the United States of America. This is not the greatest free democracy in the world. This is a nation at war with itself.'" Shortly after the shootings took place, the Urban Institute conducted a national study that concluded the Kent State shooting was the single factor causing the only nationwide student strike in U.S. history —over 4 million students protested and over 900 American colleges and universities closed during the student strikes. The Kent State campus remained closed for six weeks. President Nixon and his administration's public reaction to the shootings was perceived by many in the anti-war movement as callous. Then National Security Advisor Henry Kissinger said the president was "pretending indifference." Stanley Karnow noted in his Vietnam: A History that "The [Nixon] administration initially reacted to this event with wanton insensitivity. Nixon's press secretary, Ron Ziegler, whose statements were carefully programmed, referred to the deaths as a reminder that 'when dissent turns to violence, it invited tragedy.'" After the shootings people came out against the actions taken. Here an unknown witness supported the actions by the National Guard. "I think that the guardsmen were provoked beyond reason. I believe that we used every conceivable effort to get the people to disperse and to move, long before the formation moved up to the hill. And we regret this as much as anyone, that people were killed and wounded. We even regret the fact that it was necessary to be here." Karnow further documented that on May 9, 1970 at 4:15 a.m., the president met about 30 student dissidents conducting a vigil at the Lincoln Memorial whereupon Nixon "treated them to a clumsy and condescending monologue, which he made public in an awkward attempt to display his benevolence." Nixon had been trailed by White House Deputy for Domestic Affairs Egil Krogh, who saw it differently than Karnow, saying, "I thought it was a very significant and major effort to reach out." In any regard, neither side could convince the other and after meeting with the students Nixon expressed that those in the anti-war movement were the pawns of foreign communists. After the student protests, Nixon asked H. R. Haldeman to consider the Huston Plan, which would have used illegal procedures to gather information on the leaders of the anti-war movement. Only the resistance of J. Edgar Hoover stopped the plan. Ten days after the Kent State shootings, on May 14, two students were killed by police at the historically black Jackson State University under similar circumstances, but that event did not arouse the same nationwide attention as the Kent State shootings. There was wide discussion as to whether or not these were legally justified shootings of American citizens, and whether or not the protests or the decisions to ban them were constitutional. These debates served to further galvanize uncommitted opinion by the terms of the discourse. The term "massacre" was applied to the shootings by some individuals and media sources, as it had been used for the Boston Massacre of 1770, in which five were killed and several more wounded. On June 13, 1970, President Nixon established the President's Commission on Campus Unrest, known as the Scranton Commission, which he charged to study the dissent, disorder, and violence breaking out on college and university campuses across the nation. Even if the guardsmen faced danger, it was not a danger that called for lethal force. The 61 shots by 28 guardsmen certainly cannot be justified. Apparently, no order to fire was given, and there was inadequate fire control discipline on Blanket Hill. The Kent State tragedy must mark the last time that, as a matter of course, loaded rifles are issued to guardsmen confronting student demonstrators. In September 1970, twenty-four students and one faculty member were indicted on charges connected with the May 4 demonstration or the ROTC building fire three days before. The individuals, who had been identified from photographs, became known as the "Kent 25." Five cases, all related to the burning of the ROTC building, went to trial; one non-student defendant was convicted on one charge and two other non-students pleaded guilty. One other defendant was acquitted, and charges were dismissed against the last. In December 1971, all charges against the remaining twenty were dismissed for lack of evidence. Eight of the guardsmen were indicted by a grand jury. The guardsmen claimed to have fired in self-defense, which was generally accepted by the criminal justice system. In 1974 U.S. District Judge Frank Battisti dismissed charges against all eight on the basis that the prosecution's case was too weak to warrant a trial. In May 2007, Alan Canfora, one of the injured protestors, demanded that the case be reopened, having found an audiotape in a Yale University government archive allegedly recording an order to fire ("Right here! Get Set! Point! Fire!") just before the 13 second volley of shots. Canfora has been on a crusade since discovering the tape, hoping to get authorities to reopen the case and use new technology to perform voice analysis. Larry Shafer, a guardsman who said he fired during the shootings and was one of those charged told the Kent-Ravenna Record-Courier newspaper in May 2007:" I never heard any command to fire. That's all I can say on that," Shafer, a Ravenna city councilman and former fire chief, told the newspaper. "That's not to say there may not have been, but with all the racket and noise, I don't know how anyone could have heard anything that day." Shafer also went on to say that "point" would not have been part of a proper command to open fire. The years following the shootings (1970 to 1979) were filled with lawsuits filed by families of the victims against the State of Ohio, in hopes of placing blame on Governor Rhodes and the Ohio National Guard. Trials were held on both the federal and state level but all ended in acquittals or were dismissed. There was one civil trial for wrongful death and injury brought by the victims and their families against Governor Rhodes and the National Guardsmen that was originally dismissed but eventually the dismissal was overturned due to the judge excluding evidence. The students' families were awarded approximately $63,000 per victim and the defendants agreed to state for the record that they regretted their actions. To those who think murder is too strong a word, one may recall that even Agnew three days after the Kent State shootings used the word in an interview on the David Frost show in Los Angeles. Agnew admitted in response to a question that what happened at Kent State was murder, 'but not first degree' since there was — as Agnew explained from his own training as a lawyer — "no premeditation but simply an over-response in the heat of anger that results in a killing; it's a murder. It's not premeditated and it certainly can't be condoned. The Kent State incident forced the National Guard to re-examine its methods of crowd control. The only equipment the Guardsmen had to disperse demonstrators that day were M1 Garand rifles loaded with .30-06 FMJ ammunition, bayonets, and CS gas grenades. In the years that followed, the U.S. Army began developing less lethal means of dispersing demonstrators (such as rubber bullets) and changed its crowd control and riot tactics to attempt to avoid casualties amongst the demonstrators. Many of the crowd control changes brought on by the Kent State events are used today by police and military forces in the United States when facing similar situations, such as the 1992 Los Angeles Riots and civil disorder during the aftermath of Hurricane Katrina in 2005. One outgrowth of the events was the Center for Peaceful Change, which was established at Kent State University in 1971 "as a living memorial to the events of May 4, 1970." Now known as The Center for Applied Conflict Management (CACM), it developed one of the earliest conflict resolution undergraduate degree programs in the United States. The Institute for the Study and Prevention of Violence, an interdisciplinary program dedicated to violence prevention, was established in 1998. According to recently released FBI reports, one part-time student, Terry Norman, was already noted by student protesters as an informant for both campus police and the Akron FBI branch. Norman was present during the May 4 protests, taking photographs to identify student leaders, while carrying a sidearm and wearing a gas mask. In 1970, FBI director J. Edgar Hoover responded to questions from then-Congressman John Ashbrook by denying that Norman had ever worked for the FBI, a statement Norman himself disputed. On 13 August 1973, Indiana Senator Birch Bayh sent a memo to then-governor of Ohio, John J. Gilligan, suggesting that Norman may have fired the first shot, based on testimony he received from Guardsmen who claimed that a gunshot fired from the vicinity of the protesters instigated the Guard to open fire on the students. Throughout the almost 40 years since the shootings, debate has continued on the events of May 4, 1970. Two of the survivors have died: James Russell on June 23, 2007, and Robert Stamps in June 2008. Each May 4 from 1971 to 1975 the Kent State University administration sponsored an official commemoration of the events. Upon the university's announcement in 1976 that it would no longer sponsor such commemorations, the May 4 Task Force, a group made up of students and community members, was formed for this purpose. The group has organized a commemoration on the university's campus each year since 1976; events generally include a silent march around the campus, a candlelight vigil, a ringing of the victory bell in memory of those killed and injured, speakers (always including eyewitnesses and family members), and music. In 1990, twenty years after the shootings, a memorial commemorating the events of May 4 was dedicated on the campus on a 2.5 acre (10,000 m²) site overlooking the University's Commons where the student protest took place. Even the construction of the monument became controversial and in the end, only 7% of the design was constructed. The memorial itself does not contain the names of those killed or wounded in the shooting; under pressure, the university agreed to install a plaque near it with the names. In 1999, at the urging of relatives of the four students killed in 1970, the university constructed an individual memorial for each of the students in the parking lot between Taylor and Prentice halls. Each of the four memorials is located on the exact spot where the student fell, mortally wounded. They are surrounded by a raised rectangle of concrete featuring six lightposts approximately four feet high, with the student's name engraved on a triangular marble plaque in one corner. George Segal's 1978 cast-from-life bronze sculpture, In Memory of May 4, 1970, Kent State: Abraham and Isaac was commissioned for the Kent State campus by a private fund for public art, but was refused by the university administration who deemed its subject matter (the biblical Abraham poised to sacrifice his son Isaac) too controversial. The sculpture was accepted in 1979 by Princeton University , and currently resides there between the university chapel and library. An earlier work of land art, Partially Buried Woodshed, was produced on the Kent State campus by Robert Smithson in January 1970. Shortly after the events, an inscription was added that recontextualized the work in such a way that it came to be associated by some with the event. In 2004, a simple stone memorial was erected at Plainview-Old Bethpage John F. Kennedy High School in Plainview, New York , which Jeffrey Miller had attended. On May 3, 2007, just prior to the yearly commemoration, an Ohio Historical Society marker was dedicated by KSU president Lester Lefton. It is located between Taylor Hall and Prentice Hall between the parking lot and the 1990 memorial. Also in 2007, a memorial service was held at Kent State in honor of James Russell, one of the wounded, who died in 2007 of a heart attack. In 2008, Kent State University announced plans to construct a May 4 Visitors' Center in a room in Taylor Hall. On May 1, 2007, various news agencies reported the claim of a former student who was injured in the shooting to have uncovered new evidence that the guardsmen had been ordered to fire upon the crowd. Terry Strubbe, a student who lived in a dormitory overlooking the anti-war rally site, placed a microphone at a windowsill and recorded nearly 30 minutes of the event on reel-to-reel tape. He sent a copy of the tape to the FBI and kept a copy in a safe deposit box. The government copy has been archived at Yale University . According to Alan Canfora, who was injured in the wrist that day by a gunshot, a voice can be heard on the tape yelling, "Right here! Get Set! Point! Fire!" before the 13-second volley of gunfire. Canfora said he has obtained a copy of that tape and that he plans to release it on CD. He wants the government to reopen the investigation. In another step toward this goal, Canfora provided a copy of the tape to musician Ian MacKaye of the bands Minor Threat and Fugazi, and co-founder of Dischord Records, who digitally enhanced the recording by boosting the volume level and removing tape hiss. The best known popular culture response to the deaths at Kent State was the protest song "Ohio", written by Neil Young for Crosby, Stills, Nash & Young. The song was written, recorded, and preliminary pressings (acetates) were rushed to major radio stations, although the group already had a hit song, "Teach Your Children", on the charts at the time. Within two-and-a-half weeks of the Kent State shootings, "Ohio" was receiving national airplay. Crosby, Stills, and Nash visited the Kent State campus for the first time on May 4, 1997, where they performed the song for the May 4 Task Force's 27th annual commemoration. The B-Side of the single release was Stephen Stills' anti-Vietnam war anthem "Find the Cost of Freedom". Pete Atkin and Clive James wrote "Driving Through Mythical America", recorded by Atkin on his 1971 album of the same name, about the shootings, relating them to a series of events and images from 20th-century American history. Steve Miller's “Jackson-Kent Blues,” from The Steve Miller Band album Number 5 (released in November 1970), is another direct response. Bruce Springsteen wrote a song called “Where Was Jesus in Ohio” in May or June 1970. The unreleased and uncirculating song is reported to be the artist's emotionally charged response to the Kent State shootings. Jon Anderson has said that the lyrics of "Long Distance Runaround" (on the album Fragile by Yes, also released in 1971) are also in part about the shootings, particularly the line "hot colour melting the anger to stone." In 1970-71 Halim El-Dabh, a Kent State University music professor who was on campus when the shootings occurred, composed Opera Flies, a full length opera, in response to his experience. The work was first performed on the Kent State campus on May 8, 1971 and was revived for the 25th commemoration of the events in 1995. In 1971, the composer and pianist Bill Dobbins (who was a Kent State University graduate student at the time of the shootings), composed The Balcony, an avant-garde work for jazz band inspired by the same event. First performed in May 1971 for the university's first commemoration, it was released on LP in 1973 and was performed again by the Kent State University Jazz Ensemble in 2000 for the 30th commemoration. Dave Brubeck's 1971 cantata Truth Is Fallen is dedicated to the slain students at Kent State University and Jackson State University; the work was premiered in Midland, Michigan on May 1, 1971 and released on LP in 1972. The All Saved Freak Band dedicated their 1973 album My Poor Generation to “Tom Miller of the Kent State 25.” Tom Miller was a member of the band who had been featured in Life magazine as part of the Kent State protests and lost his life the next year in an automobile accident. Holly Near's “It Could Have Been Me,” her personal response to the shootings, was released on A Live Album (1974). Jandek's song "Governor Rhodes" is presumably a meditation on the Kent State shootings, the title a reference to the Ohio governor who ordered the National Guard to confront protesters. The song was released on the LP Telegraph Melts in 1986, but is believed by some to have been recorded shortly after the shootings. The industrial band Skinny Puppy's 1989 song "Tin Omen" on the album Rabies refers to the event. The band Polaris's song Hey Sandy, which was the theme song to the Nickelodeon series The Adventures of Pete & Pete, may have referenced the shootings and Sandra Scheuer (being the titular "Sandy" of the song), although the actual meaning of the song is in debate. Lamb of God's 2000 song "O.D.H.G.A.B.F.E." references Kent State, together with the Auschwitz concentration camp , the Tiananmen Square protests of 1989 , the 1968 Democratic National Convention and the Waco siege . A commemorative 2-CD compilation featuring music and interviews was released by the May 4 Task Force in May 2005, in commemoration of the 35th anniversary of the shootings. Joe Walsh, who briefly attended Kent State, has said that he wrote "Turn to Stone" in response to the shootings. He also mentions the event in the song "Decades" (1992). Lodi, New Jersey -based horror punk band Mourning Noise mentions this event in their song "Radical" recorded live for their album "Death Trip Delivery". One of the students who participated in the protest was Chrissie Hynde, future leader of The Pretenders, who was a sophomore at the time. Mark Mothersbaugh and Gerald Casale, founding members of Devo, also attended Kent State at the time of the shootings. Casale was reportedly "standing about away" from Allison Krause when she was shot, and was friends with her and another one of the students who was killed. The shootings were the transformative moment for the band, which became less of a pure joke and more a vehicle for social critique (albeit with a blackly humorous bent). Gwar references the Kent State shootings in the song "Slaughterama" saying "Good thing I was such an expert shot with the National Guard back at Kent State, I bagged four that day"
Genesis recreates the events from the perspective of the Guards in the song The Knife, on Trespass (October 1970). Against a backdrop of voices chanting "We are only wanting freedom," a male voice in the foreground calls "Things are getting out of control here today", then "OK men, fire over their heads!" followed by gunshots, screaming and crying. The song became a concert mainstay, and established Genesis on the prog-rock scene. Barbara Dane sings "The Kent State Massacre," written by Jack Warshaw on her 1973 album I Hate the Capitalist System. Harlan Ellison's 1971 story collection Alone Against Tomorrow is dedicated to the four students who were killed. Lesley Choyce's 1994 novel, The Republic of Nothing mentions how one character hates President Richard Nixon due in part to the students of Kent State. The incident is mentioned in Allen Ginsberg's 1975 poem Hadda be Playin' on a Jukebox. The poem "Bullets and Flowers" by Yevgeny Yevtushenko is dedicated to Allison Krause. Krause had participated in the previous days' protest during which she reportedly put a flower in the barrel of a Guardsman’s rifle, as had been done at a war protest at the Pentagon in October 1967, and reportedly saying, "Flowers are better than bullets." Peter Makuck's poem "The Commons" is about the shootings. Makuck, a 1971 graduate of Kent State, was present on the Commons during the incident. Gary Geddes' poem Sandra Lee Scheuer remembers one of the victims of the Kent State shootings. 1977 - Kent State: A Requiem by J. Gregory Payne. First performed in 1976. Told from the perspective of Bill Schoeder's mother, Florence, this play has been performed at over 150 college campuses in the U.S. and Europe in tours in the 1970s, 1980s, and 1990s; it was last performed at Emerson College in 2007. It is also the basis of NBC's award-winning 1981 docudrama Kent State. In her 1996 multimedia work Partially Buried, visual artist Renée Green explores the history of the shootings within a wider historical and cultural context. 1970 - Confrontation at Kent State (director Richard Myers) - documentary filmed in Kent, Ohio directly following the shootings by a Kent State University filmmaker. 1971 - Allison (director Richard Myers) - a tribute to Allison Krause. 1979 - George Segal (director Michael Blackwood) - documentary about American sculptor George Segal; Segal discusses and is shown creating his bronze sculpture Abraham and Isaac, which was originally intended as a memorial for the Kent State University campus. 2000 - Kent State: The Day the War Came Home (director Chris Triffo) - documentary featuring interviews with injured students, eyewitnesses, guardsmen, and relatives of students killed at Kent State. 2007 - 4 Tote in Ohio: Ein Amerikanisches Trauma ("4 dead in Ohio: an American trauma") (directors Klaus Bredenbrock and Pagonis Pagonakis) - documentary featuring interviews with injured students, eyewitnesses and a German journalist who was a U.S. correspondent. 2008 - How It Was: Kent State Shootings - National Geographic Channel documentary series episode. 1970 - The Bold Ones: The Senator, a television program starring Hal Holbrook, aired a two-part episode titled "A Continual Roar of Musketry" which was based on a Kent State-like shooting. Holbrook's Senator character is conducting an investigation into the incident. 1998 - A passing reference is made in the film Fear And Loathing In Las Vegas (set in early 1971), when Duke overhears a police officer mention how he "took on them little peckerheads down there at Kent State". 2000 - In the Family Guy episode Story on Page One, Lois recalls how the Rhode Island National Guard came to her college and shot some of her friends. In the Simpsons episde Do'hin In the wind Homer as a hippie places flowers in the cops rifle parodying the massacre. Only the result was Chief Wiggum fired a flower in homer's head. 2005 - Thank You for Smoking - Nick Naylor references the Kent State Shootings while describing the military enlistment motives of his friend Bobby Jay Bliss. "These would be the first of many probes into what soon became known as the Kent State Massacre. Like the Boston Massacre almost exactly two hundred years before (March 5, 1770), which it resembled, it was called a massacre not for the number of its victims but for the wanton manner in which they were shot down." Darrell Laurent, "Kent State — A history lesson that he teaches and lives - Dean Kahler disabled during 1970 student demonstration at Kent State University", Accent on Living, Spring 2001. Accessed at . May 4 Archive - Sandy Scheuer. http://dept.kent.edu/sociology/lewis/lewihen.htm "The May 4 Shootings at Kent State University: The Search For historical Accuracy". http://www.upi.com/Audio/Year_in_Review/Events-of-1970/Apollo-13/12303235577467-2/#title "Kent State Shootings: 1970 Year in Review, UPI.com". The Report of the President's Commission on Campus Unrest, William W. Scranton, Chairman, US Government Printing Office, 1970, pg. 273-274. Retrieved August 15, 2009. This book is also known as The Scranton Commission Report. http://www.upi.com/Audio/Year_in_Review/Events-of-1970/Apollo-13/12303235577467-2/#title "1970 Year in Review, UPI.com". Kent 25 Retrieved 16 April 2007. Verifying documents are in the Special Collections archive at the Kent State University library. May 4 Memorials: Eyewitnesses react. This link includes the audio clip of the tape. Bills, Scott. (1988). Kent State/May 4: Echoes Through a Decade. Kent, OH: Kent State University Press. ISBN 0-873-38278-1. Caputo, Philip. (2005). 13 Seconds: A Look Back at the Kent State Shootings. New York: Chamberlain Bros. ISBN 1-596-09080-4. Davies, Peter and the Board of Church and Society of the United Methodist Church. (1973). The Truth About Kent State: A Challenge to the American Conscience. New York: Farrar, Straus & Giroux. ISBN 0-374-27938-1. Eszterhas, Joe, and Michael D. Roberts (1970). Thirteen Seconds: Confrontation at Kent State. New York: Dodd, Mead. ISBN 0-396-06272-5. Gordon, William A. (1990). The Fourth of May: Killings and Coverups at Kent State. Buffalo, NY: Prometheus Books. ISBN 0-879-75582-2. Updated and reprinted in 1995 as Four Dead in Ohio: Was There a Conspiracy at Kent State? Laguna Hills, CA: North Ridge Books. ISBN 0-937-81305-2. Langguth, A. J. (Jack). (1997). Our Vietnam: The War 1954-1975. New York: Simon & Schuster. ISBN 0-743-21231-2. Listman, John W. Jr. " Kent's Other Casualties", National Guard magazine, May 2000. Michener, James. (1971). Kent State: What Happened and Why. New York: Random House and Reader's Digest Books. ISBN 0-394-47199-7. Payne, J. Gregory (1981). Mayday: Kent State. Dubuque, Iowa: Kendall/Hunt Pub. Co. ISBN 0-840-32393-X. Renner, James. " 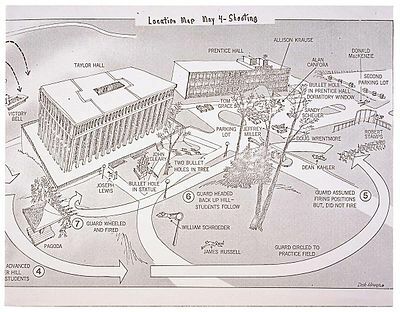 The Kent State Conspiracies: What Really Happened On May 4, 1970? ", Cleveland Free Times, vol 13, issue 3 May 2006. Report of the President's Commission on Campus Unrest ("Scranton Commission"). (1970) Washington, D.C.: U.S. Government Printing Office. ISBN 0-405-01712-X. Stone, I. F. (1970). The Killings at Kent State; How Murder Went Unpunished. New York: Vintage Books. ISBN 0-394-70953-5. Stone, I. F. "Fabricated Evidence in the Kent State Killings", The New York Review of Books, Volume 15, Number 10, 3 December 1970. Weissman, Norman. (2008). Snapshots USA. Mystic, CT: Hammonasset House Books. ISBN 0-980-18941-1. Links, photos, comic strips, music and eyewitness reports about the shootings at Kent State. AlanCanfora.com - personal website of one of the survivors; historical information, photographs, & commentary. Kent State Remembered - A collection of articles regarding the Kent State Protest. Mike and Kendra's Kent State, May 4 1970 web site - Detailing the commemoration process and related controversies and providing sources for research.